Swimming Books - Books on Sports - Sport Books: Catalog of books about your favorite sports. 2019 Swimming books on sale now. Buy your 2019 Swimming books with us today. We have many Swimming books to choose from and each purchase comes with the ease and convenience of Sportspool's online experience. We hope you find the Swimming book that is perfect for you! 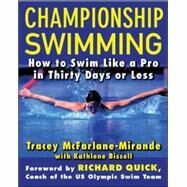 "From an Olympic medalist, a proven, step-by-step program for helping you swim your best Endorsed by Olympic gold medalist Jenny Thompson and written by two-time Olympic winner Tracey McFarlane-Mirande, 'Championship Swimming brings Olympic-level techniques and training to intermediate swimmers who want to achieve their best. With her proven program, McFarlane-Mirande takes you from 0 to 60 in just 30 days. This comprehensive manual features: Step-by-step drills for improved strokes and more enjoyable workouts Tips on how to eliminate 'drag' Techniques for swimming more powerfully with less effort Dry-land exercises Easy-to-follow illustrations From intermediate to competitive swimming, 'Championship Swimming is sure to improve the quality of every swim, whether for leisure, exercise, or going for the gold."